Over 1,000 RAF servicemen and women performed a ceremonial parade on The Mall in central London, along with nearly 300 personnel lining the route, including people from a variety of roles and RAF stations, representing the full diversity of the current Air Force. Earlier the family attended a service of thanksgiving at Westminster Abbey, a day after attending Prince Louis' Christening, which the Queen missed due to her packed schedule. After cruising toward London and flying over the Olympic Park and the capital's financial center, they will roar past the royal family, who will be watching from the palace balcony. They include Kate's cousin Lucy Middleton, Nicholas van Cutsem, whose daughter was a bridesmaid at May's wedding of Harry and Meghan, and Guy Pelly, a childhood friend of William's. The Queen and Duke of Edinburgh will not attend the christening. Later today, Meghan and Harry will fly to Dublin where they'll spend the next two days. Standing in the forecourt of Buckingham Palace as she presented a new Queen's colour to the RAF, she spoke of the "remarkable contribution to defence" over the last 100 years. The Duke and Duchess of Cambridge have chosen six godparents for their son Prince Louis. The Red Arrows - one of the world's premier aerobatic display teams - were among 100 planes that took part in the RAF 100 Flypast, representing 100 years of the RAF. Archbishop of Canterbury Justin Welby highlighted how members of his own family have served and been killed in the RAF - drawing attention to his own father who flew in Burma. The Queen is scheduled to meet President Donald Trump later this week. 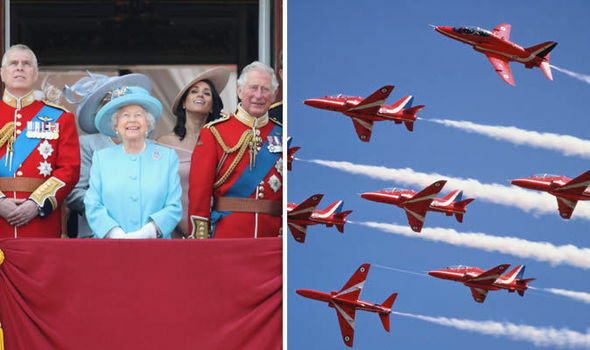 The event marked the 100th anniversary of the world's oldest Air Force - the Royal Air Force - which was formed on April 1, 1918, independent of the British Army and Royal Navy.